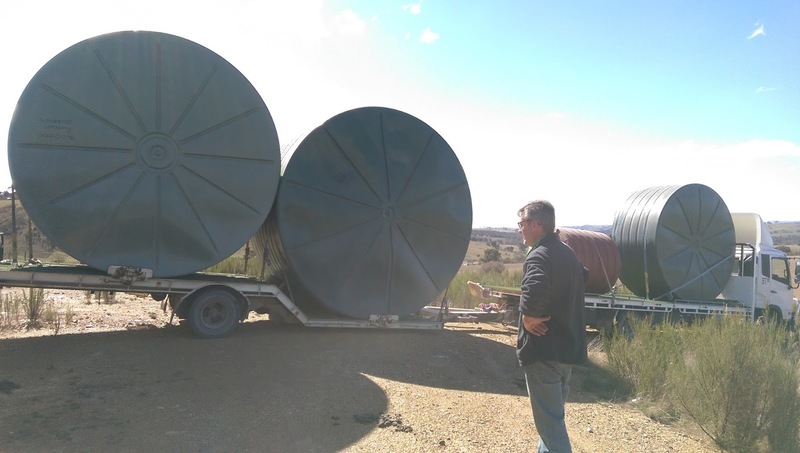 Irrigear Goulburn are agents for Bushman tanks. 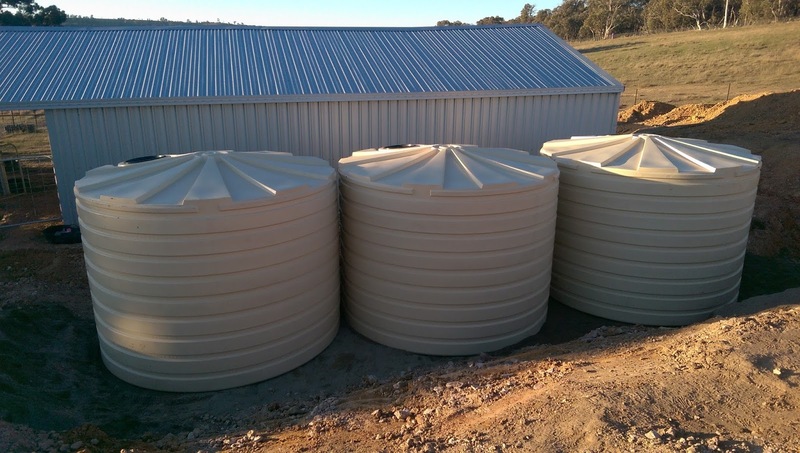 We can organise delivery and installation of your tanks direct to site. 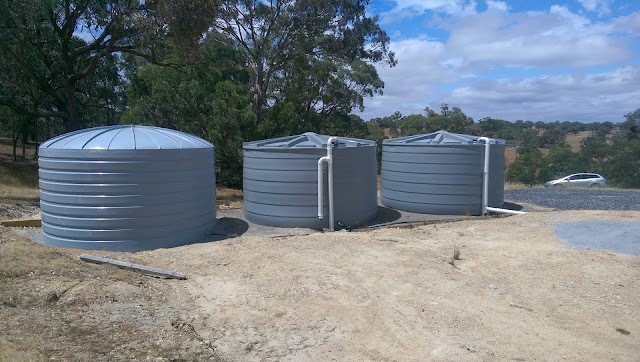 Rain water tank installation is critical to the effectiveness of your tank and it is important this guide is followed to ensure a long life for your tanks. If this guide is not followed then Bushmans guarantee may be voided. You can download the PDF version of our Bushmans Installation Guide here. 1) Prepare a reinforced concrete pad that is level and 300 mm wider than the diameter of tank OR prepare an earth ring 300mm wider than the diameter of the tank so that no part of the tank is bearing on the wall. Fill is to be consolidated fill with 50-75mm (2-3”) of sand or crusher dust on surface. 2) Tank is rolled to position (if position requires a crane this will be at purchaser’s expense). 3) Tank must be secured or water filled to 25mm to prevent blow-away (no responsibility taken for tanks being damaged in this manner). …go to steps 4 – 6. 1) Prepare a stand that has hardwood decking with gaps no grater than 25mm (1”). Decking should be supported structurally by bearers strong enough to prevent sagging of decking when tank is full. 2) Tank must be lifted into place by crane (if positioning requires a crane this will be at purchaser’s expense). 4) Water Inlet – Water should be directed into tank through the strainer. Fixed inlets must be suported and have flexible hose fitted (similar to outlet instructions). Inlet pipe must be supported by stand. 5) Water Outlet – Connect your outlet with flexible hose 300mm (12”) in length. The hose must be placed between the valve and all other plumbing or rigid pipe work. Elbow fittings must be used as shown (important: Water capacity of the inlet must equal water capacity of the overflow e.g. 2 x 100mm (4”) inlets = same capacity overflow). 6) Water Outlet – Overflow – Connect overflow. Water must be piped away from the tank. 1) Make sure tank pad is level and position tank. 2) Mark outlet position on tank. 3) Drill outlet hole to suit tap or gate valve fitting with wither a 22mm spade bit, or a 46mm (1 inch outlet) or 63mm (2 inch outlet) hole saw. 4) Next use a 98mm hole saw to drill out overflow as per Overflow Installation leaflet in the kit. The overflow must be positioned in the middle of the flat spot. 5) Insert overflow elbow into drilled hole until seal touches tank wall and screw into place using supplied screws. Push ‘mozzie’ screen or overflow strainer into overflow outlet hole until it bottoms out. 6) Remove strainer screws and remove strainer. 7) Place conduit in strainer hole, feed it through drilled outlet hole. 8) To insert brass fitting in outlet, undo nut off outlet and slide outlet and washer down conduit. Pull through from outside. 9) Screw nut on and tighten firmly by hand (left handed thread). 10) Place thread tape onto outlet thread and fit ball valve. Tighten with multigrips. 12) Place strainer back into tank and screw back in to place so it is sealed and vermin proof. 13) Assemble flex hose using thread tape, attach elbow to ball valve. – Check you’re prepared for our driver to position tank, drill outlets, fit taps & seal. – Check there is suitable and safe site access (see preparing for delivery). – Site must be prepared as per instructions. – Check enough people are present to assist tank positioning (see table ‘assistance required’ below). – Water is immediately available to put 25mm in tank to prevent blow-away. -Check there is suitable and safe site access (see preparing for delivery). -Check enough people are present to assist tank positioning (see table ‘assistance required’ below). 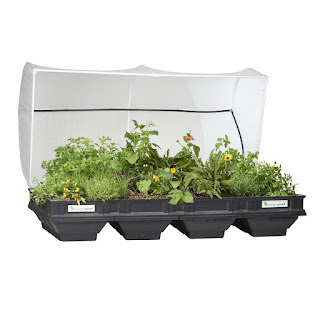 -Water is immediately available to put 25mm in tank to prevent blow-away. -Note instructions for roll-off delivery (see preparing for delivery). -Centre of outlet should be at a height of 115mm to ensure proper sealing. -Pick, shovel, crowbar, level, drill, hacksaw, multigrips, ladder, electrical conduit (12mm), thread tape (plumbers tape). 98mm(overflow), 63mm (2”) or 46mm (1”)(outlet), 22mm spade bit (1”) (moulded outlet). This Easy Step Installation Guide will help you prepare for the arrival of your new Bushmans Tank. 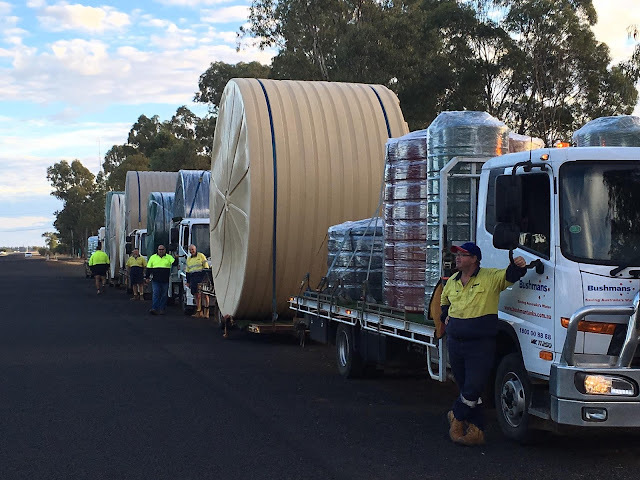 To deliver your tank without damage please ensure that you notify logistics if there is not sufficient space for an oversize semi-trailer to around or if there are any obstacles that the driver will need to consider. (A minimum of 50m turning space is required, max dimensions of truck: 21m(L) x 2.5m(W) x 5.2m(H). Obstacles may include low power lines, gates, inaccessible roads, roundabouts, crossings, overhanging trees etc. Check our website to see our delivery areas). Our driver will need assistance at time of delivery to unload your tank from the truck. Please have able-bodied people available., if assistance cannot be provided then hire or use of any equipment is at purchaser’s expense (i.e.crane hire, 4WD tractor, backhoe hire, front end loader hire). Onsite delivery is where our driver will help site the tank only if the provided conditions are met as per the Checklist., if you have followed the guidelines, the site is prepared and safe, our driver will install your tank. Roll-off delivery is if the site is not prepared so it can be installed at a later date. Check it is possible to roll the tank off without damage, when moving into position avoid rough and sharp surfaces, ensuring the area to unload the tank is level and clear of building material. (Due to OH&S drivers will not unload or transport the tank to the installation site, or leave the tank onsite if insufficient assistance or unsafe access is provided. The driver has the final decision to assess suitability of the site. 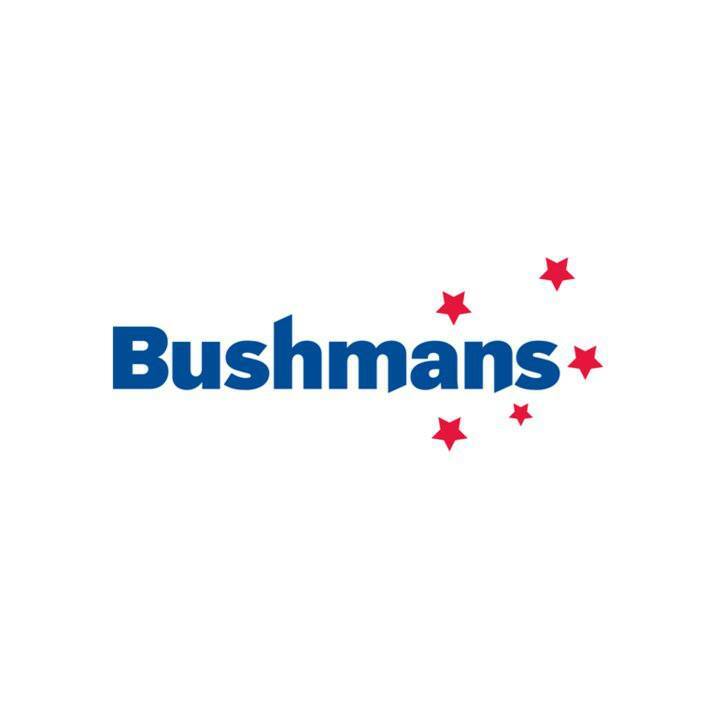 Bushmans take no responsibility for tanks being damaged if site is unprepared). If delivery cannot be made to your site Bushmans will automatically attempt delivery again at the purchaser’s expense. Please advise prior to delivery if you need any extra Bushmans fittings or valves. Extra fittings are available upon request at additional cost. Check with local council for regulations relating to rain water tank installations. See fittings & accessories for more information. When plumbing the inlet, overflow or outlets, ensure allowances are made for the poly tank to move position, expand and contract. Typical PVC or metal fittings are relatively rigid and inflexible. (Purchase and delivery of any additional plumbing fittings and pipes are responsibility of purchaser. Our guarantee specifies a 300mm flexible hose be fitted to the outlet). When your tank arrives you must put at least 25mm (1”) of water into the tank. If water is not available ensure that the tank is tied down to secure it from blow-away and damage (Bushmans take no responsibility for tanks being damaged if the tank is not secured properly). 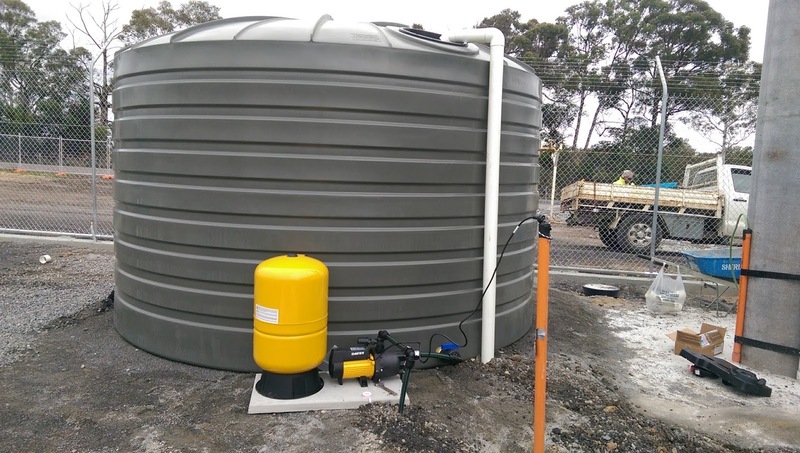 Water tank stands can be used but must be designed by a qualified consulting engineer (due to OH&S our drivers and service people are not permitted to work at heights and therefore cannot assist in placing or servicing tanks on stands).